An Aladdin's cave, a box of delights. Bruton's best-kept secret. Zoe Ford of Swan Vintage is turning her passion and creative energy into a High Street treasure that her customers love. 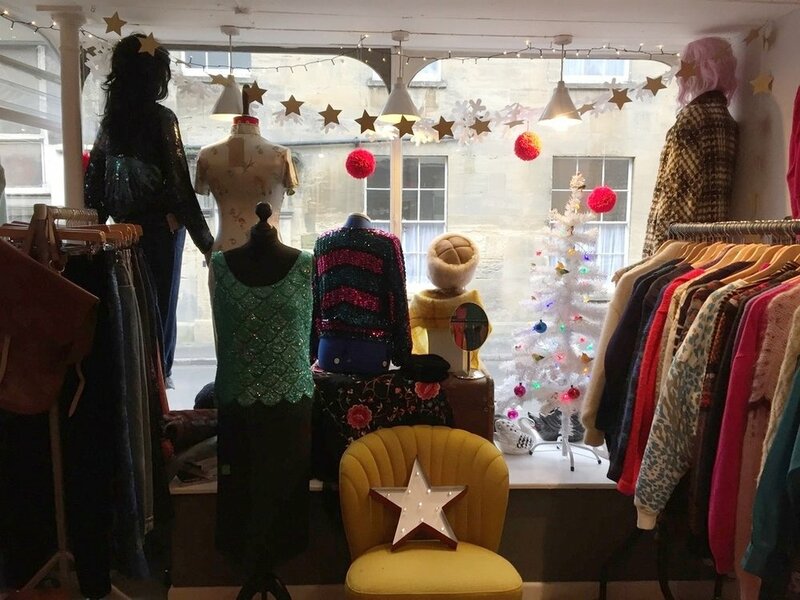 I stopped by as she was preparing the shop for Bruton's late-night shopping event - an annual festive village fixture - and Zoe talked me through the thrills and spills of getting the most out of vintage fashion. I dreamed that one day I would have a little shop on the High Street. This opportunity came up in the summer holidays just before my daughter started school, so it’s perfect. I’m part of a really nice community. It’s a good spot. I love Bruton, I’ve seen it change a lot, definitely for the better. The Hauser & Wirth gallery has brought lots of creative people to the area, and they tend to like vintage clothes. Everything in the shop is handpicked, I choose everything. And if I have something in here that I don’t like, I have to get rid of it. It’s like a work in progress, it changes all the time. I just love it! Being self-employed, you’ve got to keep up that momentum, keep yourself going. I’m quite self-motivated. I’m a complete anorak, and really boring – all I think about is clothes [laughs] so it’s quite easy! 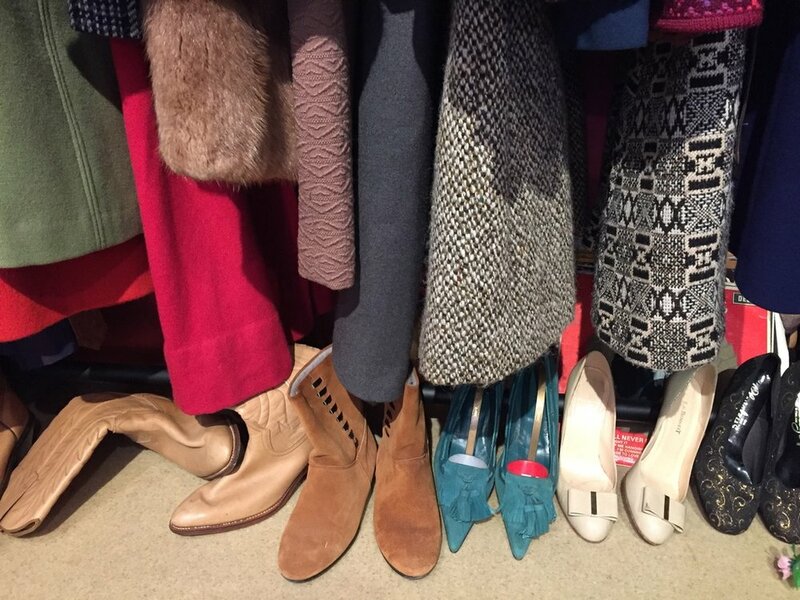 From the age of about 11 I started going to jumble sales, because I loved clothes but we didn’t have a lot of money as a family. I always liked beautiful things. My earliest memories are of dresses and Tupperware parties – the patterns, and colours. I always liked them, they made sense to me. So I used to go off on my own and find beautiful things, lambswool and cashmere sweaters, for nothing. And lovely 1950s dresses. Which I used to do awful things to. I used to hack them up. I was a teenager and I liked to make things my own. I did go to college to study fashion, but I dropped out and lived in a squat. I left home at 16, and that set me adrift for a while. But I’ve always had a desire to get myself out of what might not be a good place. I was always still looking for clothes in charity shops and at car boot sales, and would end up buying things for friends all the time. I’d think, ‘Oh my God, she’d look amazing in that!’ One of them said, “Why don’t you do a market stall, you’re really good at this?” In the end she convinced me. I did it, and it went really well. I obsess about stuff. Often I’m looking for something for myself, or for something in particular, and you find lots of great things along the way. It’s keeping it relevant, and wearable. I think I’m really lucky – I can see the beauty. I love seeing what’s happening, to see what Gucci is doing, or Prada. They’ve brought out lots of beaded cardigans that are really reminiscent of the ones from the 1950s and 60s. My God, I love those cardigans. And I love some of the really old vintage stuff, but how wearable is it? You might be able to wear a particular dress maybe, for one occasion. A lot of it is utterly gorgeous, but it’s falling apart because of its age. I like to think that you can enjoy wearing my pieces. But I mix it up. I like my trainers. I like modern. I love colour. I want to be accessible, and to follow what’s going on in fashion. Plus, vintage is recycling! It really is. I can’t say, hand-on-heart, that I got into it for ethical reasons – I do it because I love it, and that’s that – but it is kind of an added bonus. Fashion is great, and it’s fun, and we should enjoy it. It should just be a joyful thing. I sometimes imagine what kind of person will buy a particular item – and they will come in! I had this yellow dress that was a mad 1960s, bright yellow mini-dress. And I thought, “That will look great on a beautiful young black woman with a natural afro”. And that’s who bought it. I’d never met her before! It kind of happens. It’s like breathing life back into things. I imagine it all the time. I had the perfect 1970s, prison-issue, indigo denim jacket. It was gorgeous, to die for. I would have liked to keep it, but I have to pay the bills. So you sell things, that’s what comes first. I think it was made for a man, but people were slighter then, so I thought it would look great on a woman. A chap came in, and bought it for his wife (it later transpires that the guitarist, Jesse Wood, bought the jacket for his wife, Fearne Cotton). It’s just so exciting, to see the journey it had been on. You can kind of envisage things on different people. I used to love the tea-dresses they did in Topshop, maybe 10 or 15 years ago. I thought they were great. I love Welsh tapestry, especially from the 60s. It makes me happy wearing it because it reminds me of my grandma when I was a little girl, and she had the most beautiful house and colourful clothes. And I love 70s men’s velvet jackets, with the big collars. 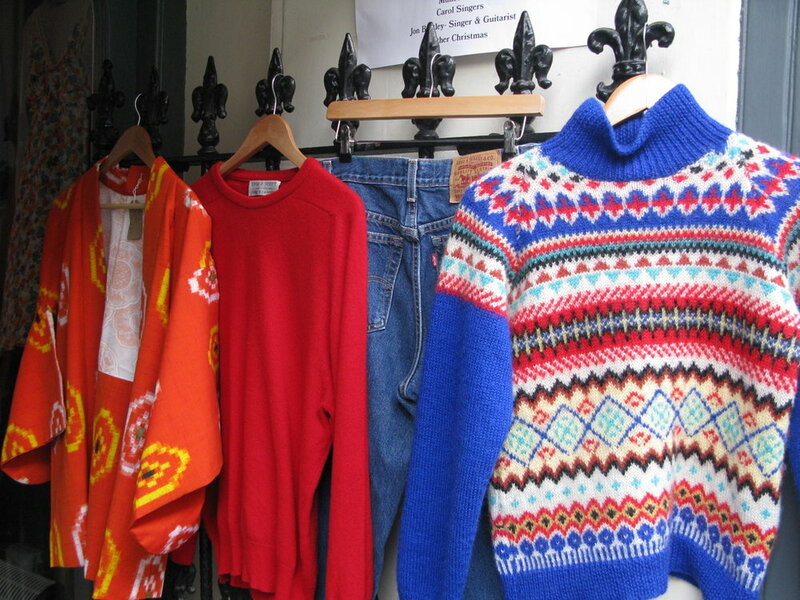 I still go to charity shops – and I still find nice things. We were in Liverpool recently, and wherever I go I’m always looking for stuff. I just kind of make it part of my everyday. I’m always interested in how other vintage shops do things. The internet is brilliant, I can potentially sit here in the shop, or when my daughter is in bed, and search. And the great thing about social media is, you get connected to like-minded people. You discover fashion, and colour and art. It’s great. There’s a young designer called L.F Markey – I really like her denim boiler suits. I’m watching Stranger Things on Netflix, I’ve binge-watched that. I was a child in the 80s so it evokes the excitement that you felt then! It’s all on-trend at the moment, and young people are going to be influenced by the fashions. So that’s what I should be buying…all the high-waist denim and stuff. At the end of the day, I really want things to be wearable, affordable, and fun. To make you feel good. I want to be inclusive. I want everybody to be able to afford to come into the shop because, I know what it’s like. I had my son when I was really young (he’s nearly 21 now) – I didn’t have much money. I want young mums to be able to come in and treat themselves. I always seem to have a good trade, I get lots of repeat customers. I’m really lucky, people are loyal and they comment on things and say how nice they are. That makes me feel good. But it keeps it interesting for me, and it keeps it interesting for customers to always have new stuff coming in. If everything’s flowing, that’s gotta be good, hasn’t it? I think it’s about having confidence in your own choices. And I don’t think people always have that. If you’ve got your nice Levi’s, why not chuck on a vintage blouse? It’s different to buying something from Topshop, because you know thousands of other people aren’t going to have that same vintage blouse! As a little girl I’d go on shopping trips to M&S with my mum, and I would choose my dresses and knickers – I was always like that. Like I said, my earliest memory is me at a Tupperware party, and I’m looking at the pattern on my dress and loving my dress, and I’m looking at the Tupperware and loving the colours. I was probably a bit of a weird kid who didn’t fit in. But even now I don’t mind if other people don’t like what I’m wearing, that doesn’t bother me. I’ve got that confidence, and I’m lucky. I've always have had that with clothes. The only person I’d let choose an outfit for me now is my son – he’s got a really good eye. 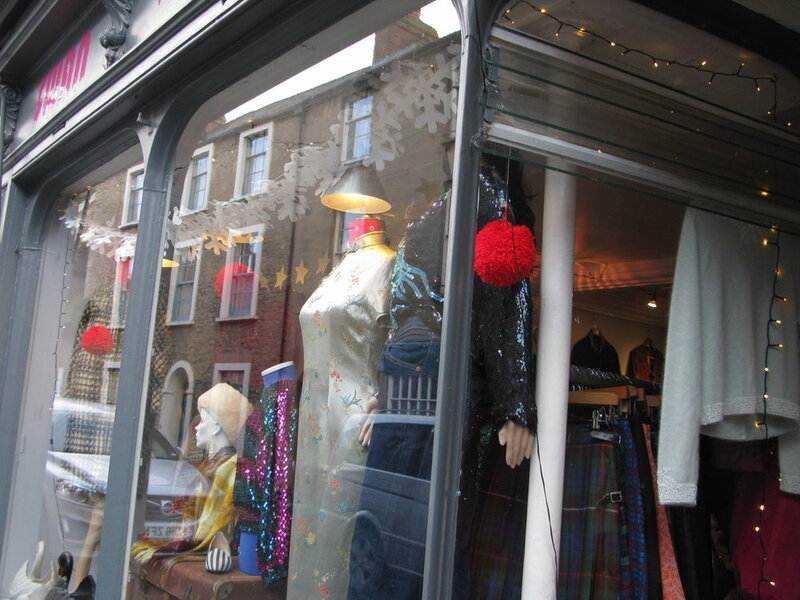 Swan Vintage can be found at 35 High St, Bruton, Somerset. Follow Zoe on Instagram and Facebook. West Coast Dreams | How to get naked in LA...and other stories.